Top Spot Motel have 16 Units. Recently refurbished and painted. Located right in the middle of Maroochydore's CBD. The heart of the Sunshine Coast. 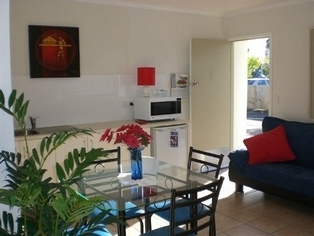 Short walk to major shopping centres, restaurants, Hotel, RSL, Post Office, Cinema's. Close to local Bus Terminal. Enjoy the river, fishing and swimming. Churches close by, 3 min drive to beach, 15 mins drive to Sunshine Coast Airport. Come and discover for yourself, the wonderful and picturesque Sunshine Coast. Maroochydore, just north of Brisbane, Australia, is the heart of the Sunshine Coast, and has a wealth of attractions, both man-made and natural, golden beaches, rivers, beautiful rainforests and breathtaking vistas from the Blackall Range. Queen in main bedroom. 2 Singles in lounge / living room. Some have Queen in main Bedroom & 1 Single bed & Pull out sofa in lounge. Air Cond, TV, Elec jug, toaster, fridge, microwave, Crockery, cutlery, linen supplied. Will confirm availability. Tastefully appointed. Garden Units. Queen sized bed in main bedroom & pull out sofa in lounge. Sleep 4. Holiday units have a Queen bed, & pull out sofa in one room. Sleeps 4. Recently refurbished. Queen bed, ensuite bathroom, flat screen TV. Air Cond, kitchenette, electric jug, toaster, fridge, microwave, crockery, cutlery and linen supplied. Rates are for 2 people. Tastefully appointed. Queen bed & single bed in one unit Sleeps 4. Queen bed, Single bed plus pull out sofa in one unit. Sleeps 5. Request your preference and we will confirm availability. Free WIFI Hot spot access. Kiosks available at Sunshine Plaza. Fax and copying available from Office. Avis Rentals next door. Can arrange tour bookings. Airport transfers. Office hours are between 9.00am - 6pm daily. Departure is by 10am. Arrivals after 1pm please. If arriving after hours, please advise and alternative arrangements can be made. Extra child or Adult is $15 per night. On site parking. Security camera surveillance. Take Bruce Highway to Maroochydore turn off and then take Maroochydore Road right through to sea, past KMarket at the Sunshine Plaza, then turn left at the next set of traffic lights and we are immediately on the right hand side. Beach Road. By train to Nambour Station and catch local bus to transit centre at the Sunshine Plaza. By bus to drop off at Infomation Centre. Sixth Avenue and then by taxi. Office hours 7.00am - 7pm. * 500 metres to Bowling Club, Bus Stop, Post Office, Jetty. * 1 kilometre Beach, Boat Ramp, Boat Hire, Golf, Tennis Court, Surf Club. * 10 Kilometres Sunshine Coast Airport. (Airport transfers available) Buderim, University, Walk ways. * 20 kilometres to Winery, Caloundra. * 30 kiometres to Hospital, Railway Station, Australia Zoo. * 45 kilometres to Noosa, Eumundi, Ginger Factory.